Thank you Country Crock for sponsoring this post. There’s nothing like fresh veggies this time of year, which makes tossing together a quick, easy, and healthy casserole just about the best thing at the end of a long day. With my daughter really excited about helping to make dinner, and doing the grocery shopping, I ended up with a few more than the three fresh zucchinis that I had selected in my shopping basket the other day. Instead of putting them back, we happily brought them home for making this delicious and low-fat casserole, which is the perfect thing for celebrating spring. Instead of being heavy and covered with loads of cheese, you can enjoy this casserole as a side or on its own. Swapping butter for Country Crock cuts down on extra calories and you’ll never taste the difference when using low-fat cheeses and milk. 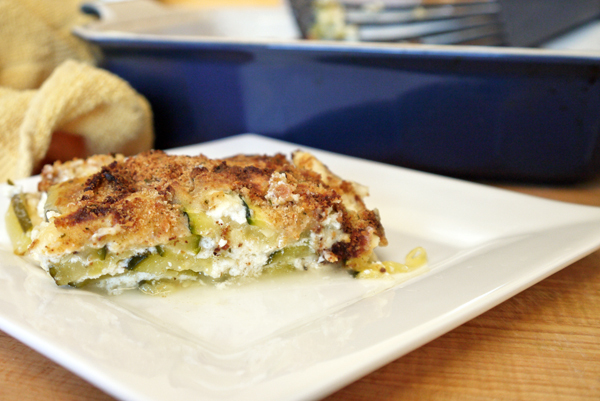 This recipe is seriously easy, so invite your little one into the kitchen to help make this light casserole. And if you love creating tasty concoctions as much as I do, head over to Country Crock Stars, enter a picture of your latest casserole, and share in 100 words how you demonstrate creativity and resourcefulness in the kitchen for a chance to win $5,000. Before inviting your child to help, wash and thinly slice the zucchini using a sharp knife, or if you’re brave, a mandolin slicer. You could also use a carrot peeler for really thin strips. 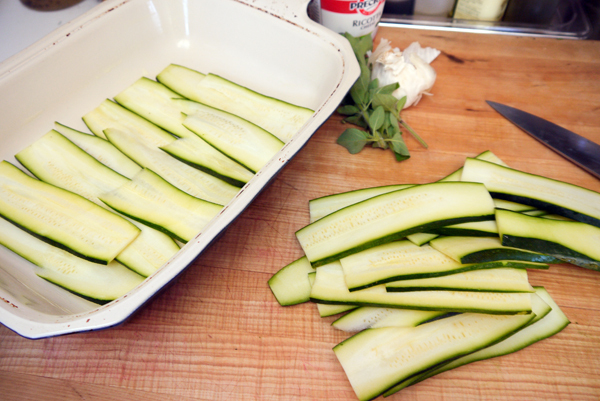 Use a bit of Country Crock to lightly grease a 9×13-inch casserole pan and then invite your child to begin layering the zucchini strips, creating one layer. Now mix together the low-fat ricotta with the freshly chopped oregano, salt, pepper, and garlic. 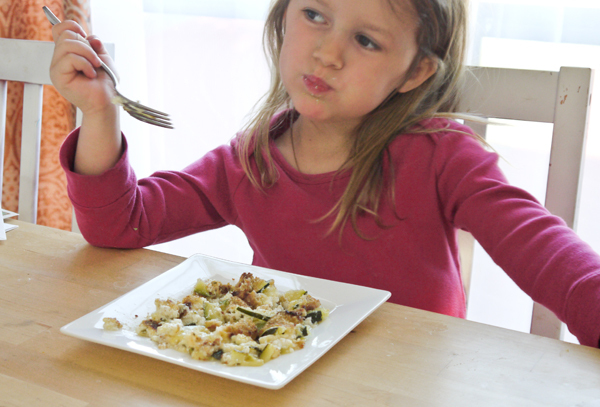 Offer your child a spoon and let her scoop and spread one third of the mixture over the sliced zucchini. 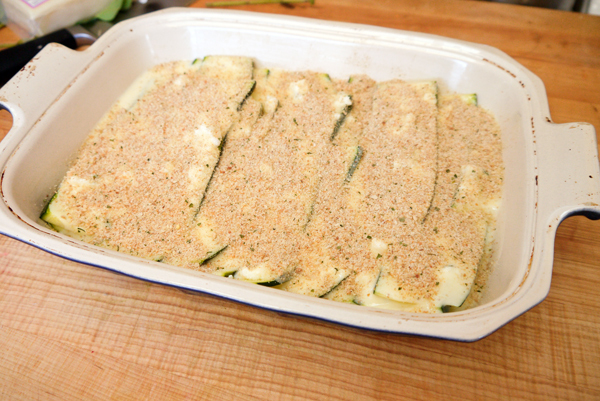 Repeat until the zucchini strips are all gone, which should turn out to be three to four layers. That simple. To make the delicious sauce, place a medium-sixed sauce pan over low heat and add two tablespoons of Country Crock. 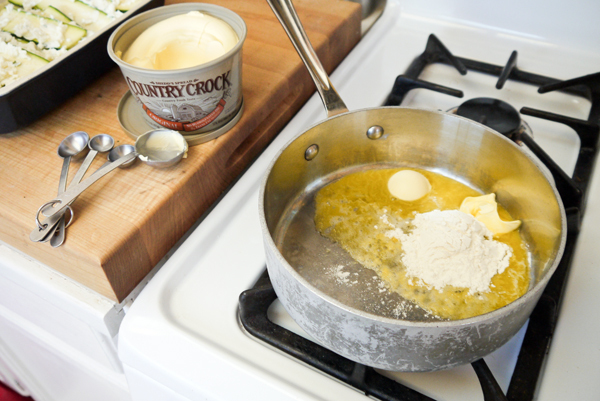 I’ve made this recipe before with butter, and I’ll admit, the Country Crock does a better job. 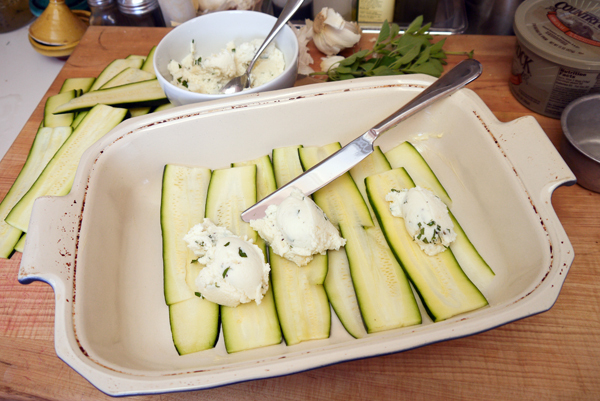 Instead of having a greasy mess at the end, the sauce holds its own against the moisture of the zucchini while baking. Let the Country Crock melt and then whisk in the flour. Now add the grainy mustard (your favorite kind is perfect) and milk. 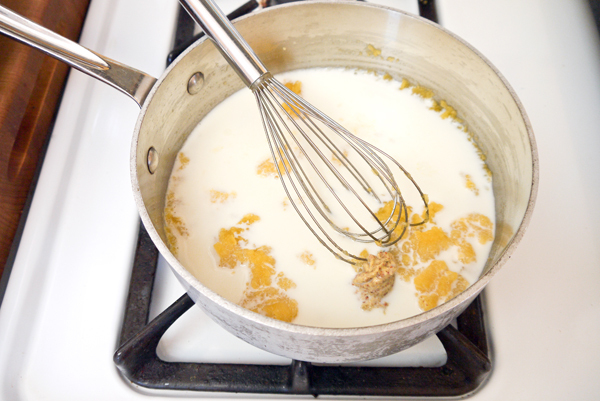 Whisk until there are no clumps and then let come to a simmer. Turn off the heat and add the low-fat Monterey Jack cheese. You could also use a low-fat Swiss, which would be heavenly. Whisk until the cheese melts. Pour the sauce over the casserole and then top with the Italian bread crumbs. I made my own combination of whole wheat bread crumbs mixed with Italian seasoning for a crunchier, and healthier, topping. Pop in your hot oven and let bubble and bake for 30 minutes. Remove the casserole and let rest for at least 10 minutes before serving, which allows all the goodness to settle and get happy. And you’ll burn your mouth if you serve it right away. Really, you will.